This is something I would normally make when it is screaming hot outside and I don't feel like heating up the house, but it's been getting warmer and I felt like something fresh and healthy. I love watching Bobby Deen's cooking show and I recently picked up a copy of his new cookbook. I have already tried seven recipes out of it and I have loved all of them. He sure is motivating to want to eat a little healthier and he has a lot of great ideas. These wraps were inspired by a recipe I saw in Bobby's new book and I thought they were great. 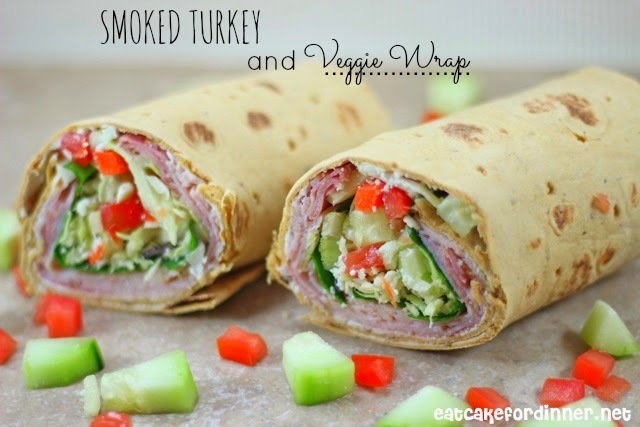 If you have any leftover ham after Easter, it would taste great in one of these wraps too. Spread a Tablespoon or two of cream cheese over surface of tortilla. Top with a few slices of deli turkey, fresh spinach leaves, slaw mix, cucumbers, tomato, Feta and any other vegetables or cheese you desire. Roll up tightly. Slice on a diagonal and serve. Jenn's Notes: Add as much of each ingredient as you like. I love the crunch and flavor the slaw mix adds. These are also great with a little Italian dressing. These look delicious. I like plenty of veggies and crunch on my wraps so this looks perfect.